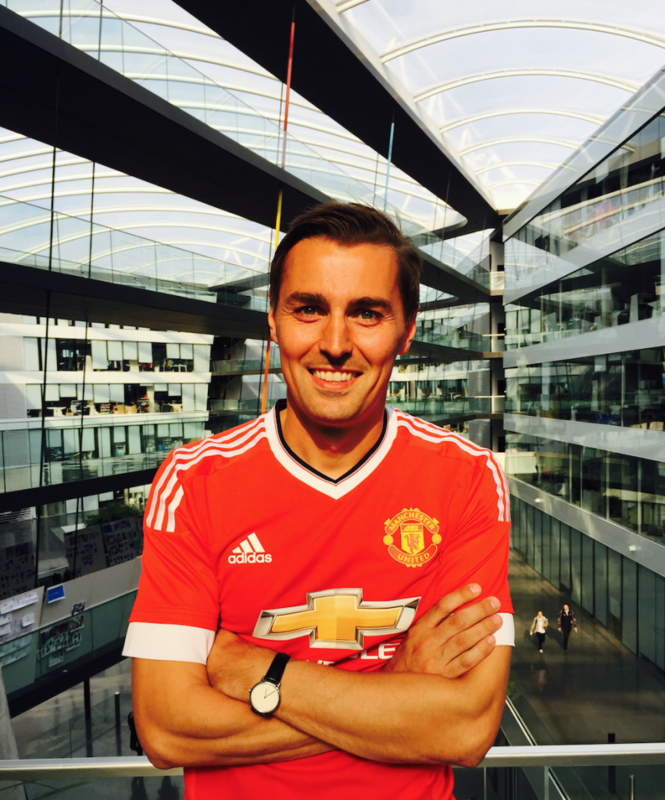 My name is Inigo Turner, I am senior designer in football design and work predominantly on our licensed apparel business, specifically Manchester United. My team. When starting out creating club and federation kits, nostalgia of course plays a role. With adidas and Manchester United partnering after a 23-year break in our relationship, it feels like two old friends reuniting after a fall-out, it feels right, it feels bloody good. To me, as a kid growing up in Manchester, my love affair with football started back when I was about 4 years old, it was our local team. 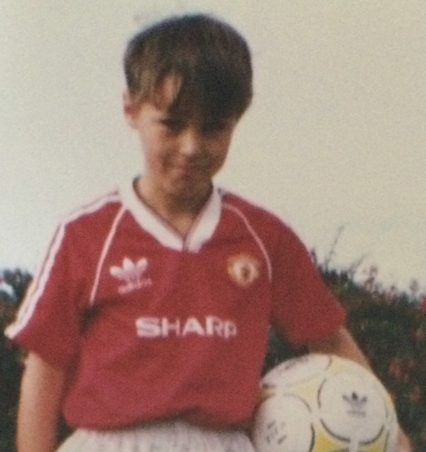 United were decked out back then in adidas kits. Those products back then were fascinating to me. The shiny fabrics had a rich and layered depth of colour, they were heavier but the weight felt lofty and valuable, special, the beautifully elegant engineered colour tipped ribs, the 3-stripe tapes sewn onto the shoulders, everything about the shirt was considered and they were adorned by my heroes. I was hooked, it was like a drug. Every birthday or Christmas there was only ever one wish for my gifts, the new shirt, and it was seldom off my back once it arrived, my parents had to sneak into my bedroom under the cover of night to wash it! I began creating my designs how my United kit would look around the age of 7. 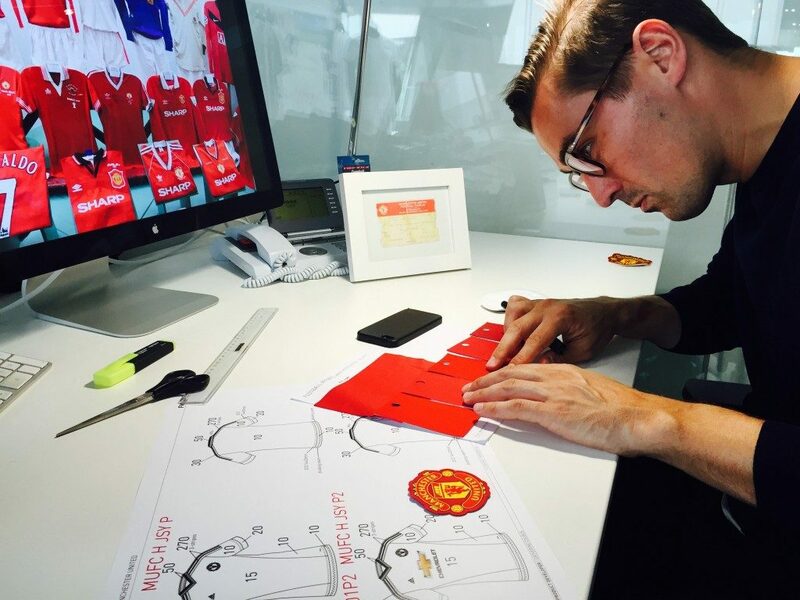 Back then, I could never imagine that I would later become a part of the team that would create the kits for Manchester United. Now, I am! Don’t let emotions cloud your judgement When we start the kit creation process, we look at the club first, the history, the fans, and how we could innovate with these components. It is always a team effort and we use all our expertise available to design the best products possible. When the highly emotive task arrived for this it was key for me to make sure I retained my objectivity and crucially my passion, which would be more difficult than normal. If I am honest, that last part was a challenge. I have loved this club and brand since my early years, that deep connection got me involved in playing football as a youngster, it shaped my career up to now and actually my whole life. Without trying to sound too dramatic, it is what I am! Thankfully, my colleagues helped me out and understood my connection. The idea was as always to make sure adidas and Manchester United look like the #1 football brand, which we believe we have. Presenting designs to the club I supported my whole life was a thrill, especially as it was much appreciated by the club. I’ve been pinching myself since I was first told this was a reality which I never quite believed was going to happen. I am still waiting to see the team walk out on August 8th onto the grass at Old Trafford with the 3 stripes once again on the shoulders of the famous red shirts of United. That will be the moment when it becomes something more tangible. Keep your dreams What I would say to anyone out there who has a passion to be involved in the things you love is simple: never stop, be relentless, be driven but do it all with a smile and sense of humour. It sounds cheesy but the clichés are true: don’t give up on your dreams. As one of my heroes Bobby Gillespie (Primal Scream) once sang, ‘Keep your dreams‘, which is good advice, I would also add ‘Live in the moment and take your chances’. At the same time, I found it helpful to have my team at my side who acted as a sounding board so that I was not getting carried away by my passion, but was able to use it in a targeted way. In the team I work in, we are also friends, we have a laugh at work and can equally discuss and debate, but the simple connecting factor above all is our passion and team spirit to achieve even greater business results. I should stop here as I could go on for hours on this subject and send people to sleep – let me know if you like the kits! I can tell you now the spirit and soul of adi guys only exists at adi. Its not to be found anywhere else..! good day INIGO T, it has been a longtime that i wanted to talk to you. just one question, how can i provide you with my Adidas designs? i like sketching, painting etc... i use to be a professional soccer player but now i busy managing call centre with the department of Public transport. i am a chelsea fc die hard fan. if you can advise me , i have designed a kit (top, short and socks), you never see it, no one have seen it. it might change the way people think about adidas. it is in my design book. just let me know how you can get them and i will send them to you. i wrote an email to you, i am still waiting for your replay. did you write an email to GamePlan A using the contact form? We didn't receive your mail. Would you mind sending it again? I hope everything is well. My name is Thomas Tovar and I’m an incoming high school senior looking to find out more information about what the best steps are for becoming a designer, like you. I wanna work along the lines of what you do. I know that I’m young and it’s a long career path from here, but I’ve been looking at schools with the best industrial design programs. I would love to get in touch with the right representative so I can find out more.